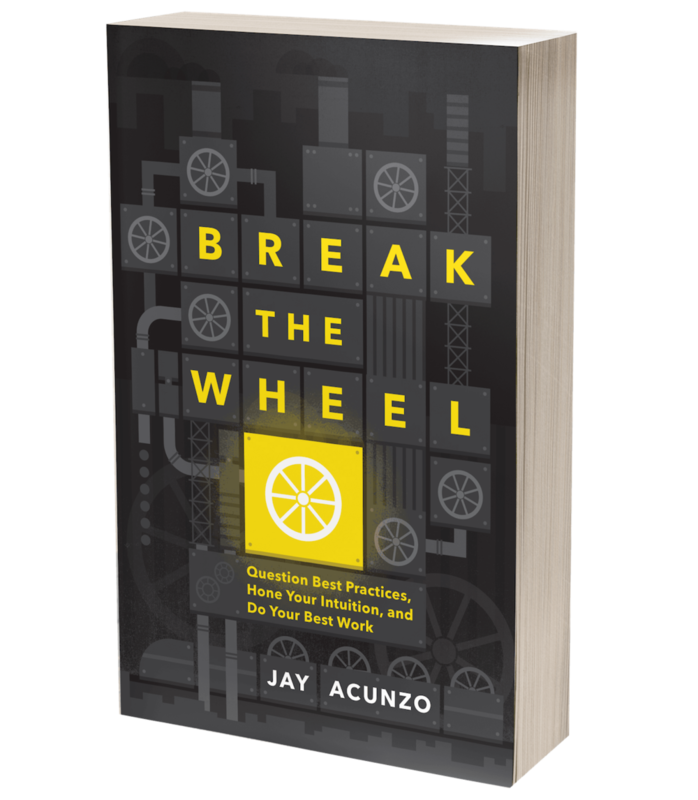 [Inside Creative Content] BlogAbout: Built by Intuition and UX — Jay Acunzo | Author. Speaker. Maker of Shows About Work. I'd like to sell you on an idea for a new creative project. First, you should know that it's going to take a long time. Like, a long, looooong time. Second, I'm not quite sure any precedents exist in our industry, and if they do, nobody is publishing any information about how effective or not effective this project can be. Oh, and I'll need some internal design resources. And total creative freedom -- yeah, let's go with that. You gotta back off for this one, Ms./Mr. CEO. One more thing to note -- the end result, while fun and engaging for our audience, won't have a nice, neat A-to-B path to ROI. It'll probably take some faith, some qualitative understanding of our prospects, and some complex attribution paths to determine our return. But I just have a gut feeling. I just KNOW this will work. Sound like a project you're excited to pitch? Me neither. But that's the origin story behind BlogAbout, the interactive blog headline generator built by IMPACT Branding and Design, a top agency in my previous home state of Connecticut. I had the chance to chat with John Bonini, their marketing director and one of the brains behind BlogAbout (and really, all of their content). As a disclosure, John's interactive app is an example of creative content I plan to cite in my upcoming Content Marketing World talk in early September. John explains how he and a teammate came up with BlogAbout and why, despite his regular reliance on data, he firmly, utterly, and completely believes in creative intuition and risk-taking in content marketing. John Bonini: It was a very personal project from me and Carly Stec (content marketing manager at IMPACT). We wanted to create something that helped us, to be honest. I could never find anything truly helpful in the way of blog topic generators. It was the same old "insert your keyword here and we’ll spit out five generic titles for you." I’ve never brainstormed like that. Brainstorming topics is a lot messier than that. It’s more interactive, there are lots of cross-outs and debates over whether something would would work or not. It’s not, "let me type the word 'Facebook' and get myself five titles and I’m good to go for the week." We wanted to create something that lent itself more naturally to the process. I wanted something that was interactive, that let people type in their own things — I’m not going to prompt keywords. I’m also not going to prompt a form-fill … but a lot of people do complete the form at the end because the process is so enjoyable and useful. So the whole reason it came about was to create something that aligned with how Carly and I actually brainstormed, and in doing so I knew what appealed to others that are in the same position. I just read Youtility by Jay Baer, and it got me off this ebook tilt. I don’t want to create ebooks just to get a form filled. And I wanted to create something that’s worthy enough to be mentioned in a book like that. The funny thing about that is that last month, Ann Handley reached out to me -- she’s mentioning BlogAbout in her upcoming book. Jay Acunzo: So how’d you sell it in? JB: Set expectations. I admitted that this wasn't going to deliver immediate ROI, which is a tough thing to sell anybody on. It’s not just the money -- it’s the time it took. You can always recoup money, but you can’t get that time back. It was a pain point for our CEO, and he expressed that. He asked several times about the ROI. JA: What made him see your rationale for doing this then? JB: I told him that BlogAbout would attract a ton of marketers who blog. We didn’t have anything to achieve top of mind awareness for us -- it was all gated material. Nothing would drive organic traffic unless we were adept at SEO. This drove a lot of organic traffic via social and email, but it also did wind up ranking well on search. He also just trusted me to make this decision. I believed that if the experience was great, we’d get a lot of forms filled, and we did. We got over a thousand forms filled, voluntarily, not prompted, and I’ve been able to build real relationships with these people. It’s also really, really heavy rapport building. I know what you’re blogging about when you use our tool, and I can talk to you directly about that. I also know more about what to blog about [on the IMPACT blog] to create future content to help them, because I have this info. JA: So what was the reaction like from your audience? JB: The first month we did it, it got the most visits on the website in the entire month. Now it’s the second- or third-most visited page in our site each month. I certainly didn’t anticipate that. It jumped right behind HubSpot on Google search rankings too. Improved lead nurturing. Based on blog topic titles, IMPACT can segment their email lists and better convert new clients. Improved lead-to-customer conversion rate. IMPACT is now able to weed out prospects who wouldn't be a fit for the agency's areas of expertise or ideal customer persona. If they're blogging about irrelevant topics to IMPACT's service offerings, they can be automatically removed from future marketing and sales efforts. What stands out most is not only the voluntary form-fills, but the ability IMPACT now possesses to convert very specific audiences (their ideal clients) in broad fashion. The tool rakes in tons of organic traffic, and IMPACT can then cherry-pick where to focus their marketing and sales based on their preferred persona. Sometimes, when you do a project or anticipate a result as a creative type, you just know something will work, or you feel you know. You're convinced because you can put yourself in the shoes of a reader/consumer better than most -- being creative is in part being highly aware and empathetic to your surroundings. But others in your organization might need more concrete data and push you for faster results. Says John, "We’ve all become obsessed with identifying quick metrics and quick ROI and if nothing supports that, scrap it and don’t do it. I knew this would be different and tougher to sell internally because we’re not requiring a form fill. I want to do this for top-of-mind awareness and word-of-mouth marketing, two powerful forms of marketing that are tougher to measure in quick ways but absolutely drive results." Posted on July 21, 2014 by Jay Acunzo and filed under content marketing, creativity.